Self driving cars are a hot topic! See this Wikipedia page on Autonomous cars for a short primer. This post is mainly a bit of exploration of how the technology is presented to the user. Germany’s transport minister told Tesla to cease using the Autopilot name to market its cars in that country, under the theory that the name suggests the cars can drive themselves without driver attention, the news agency Reuters reported Sunday. Tesla wants to be perceived as first to market with a fully autonomous car (using the term Autopilot) yet they stress that it is only a driver assistance system and that the driver is meant to stay vigilant. But I do not think term Autopilot is perceived that way by most lay people. It encourages an unrealistic expectation and may lead to uncritical usage and acceptance of the technology, or complacency. Companies must commit immediately to name automated features with descriptive—not exaggerated—titles, MacCleery adds, noting that automakers should roll out new features only when they’re certain they are safe. Using terms such as Autopilot, or releasing videos of near perfect instances of the technology will only hasten the likelihood of driver complacency. But no matter how they are marketed, these systems are just machines that rely on high quality sensor input (radar, cameras, etc). Sensors can fail, GPS data can be old, or situations can change quickly and dramatically (particularly on the road). The system WILL make a mistake–and on the road, the cost of that single mistake can be deadly. Parasuraman and colleagues have heavily researched how humans behave when exposed to highly reliable automation in the context of flight automation/autopilot systems. In a classic study, they first induced a sense of complacency by exposing participants to highly reliable automation. Later, when the automation failed, the more complacent participants were much worse at detecting the failure (Parasuraman, Molloy, & Singh, 1993). Parasuraman, R., & Molloy, R. (1993). Performance consequences of automation-induced“complacency.” International Journal of Aviation Psychology, 3(1), 1-23. Turns out… three (edit: FOUR) of the eight jobs are held by human factors psychologists. * Of course, if you want any of these jobs you’ll need a Ph.D, not just a psych major. Get your graduate applications ready for next year, folks. (And use our handy guide to give yourself a leg up). *One is officially I/O, but I think HF can claim him since he’s been President of HFES, an HFES Fellow, and Editor of the journal Human Factors. Trucks driving under very low bridges is such a large problem in Australia that they are deploying a really novel and clever warning system. A waterfall that projects a sign that’s hard to miss! Apple will introduce their next version of OSX in the fall. One of the features i’m most excited about is system-level tag support. Tags allow users to organize their files regardless of location or type. I’m particularly interested in personal, single-user-generated tagging (compared to collaborative tagging like that used in flickr) as it appears to benefit older adults information organization and retrieval (PDF). This pleases me. Usability of a Glass Dashboard? I had heard that the Tesla Model S (the luxury electric car) had a giant touch screen as one of the main interfaces for secondary car functions and always wondered what that might be like from a human factors/usability perspective. Physical knobs and switches, unlike interface widgets, give a tactile sensation and do not change location on the dashboard. Think about a car’s dashboard for a second. It’s populated with analog controls: dials, knobs, and levers, all of which control some car subsystem such as temperature, audio, or navigation. These analog dials, while old, have two features: tactility and physical analogy. Respectively, this means you can feel for a control, and you have an intuition for how the control’s mechanical action affects your car (eg: counterclockwise on AC increases temperature). These small functions provide a very, very important feature: they allow the driver to keep his or her eyes on the road. Except for a the privileged few that have extraordinary kinesthetic sense of where our hands are, the Model S’s control scheme is an accident waiting to happen. Hell, most of us can barely type with two hands on an iPhone. Now a Model S driver has to manage all car subsystems on a touchscreen with one hand while driving. 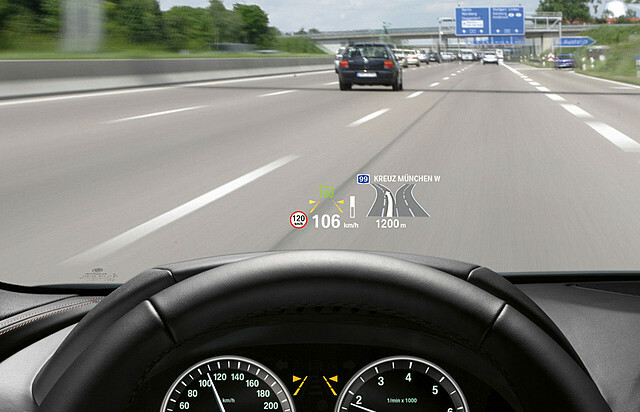 The solution, however, is may not be heads-up displays or augmented reality, as the author suggests (citing the HUD in the BMW). With the release of Apple’s in-house developed mapping solution for the new iPhone 5 (and all iOS 6 devices) there has been a major outcry among some users bordering on ridiculous, frothing, outrage1. Personally, the maps for my area are pretty good and the route guidance worked well even with no network signal. However, some of the public reaction to the new mapping program is an excellent example of too much reliance on automation that is usually very reliable but falible (we’ve written about here, and here.). It is very hard to discern what too much reliance looks like until the automation fails. Too much reliance means that you do not double-check the route guidance information, or you ignore other external information (e.g., the bridge is out). I’ve had my own too-much-reliance experience with mobile Google Maps (documented on the blog). My reaction after failure was to be less trusting which led to decreased reliance (and increased “double checking”). Apple’s “PR disaster” is a good wake up call about users unreasonably high trust in very reliable automation that can (and will) fail. Unfortunately, I don’t think it will impact user’s perception that all technology, while seemingly reliable, should not be blindly trusted. 1I say “outrage” because those users who most needed phone-based voice navigation probably had to own third party apps for it (I used the Garmin app). The old Google Maps for iPhone never had that functionality. So the scale of the outrage seems partially media-generated. Automakers: Don’t skimp on the interface! Non touchscreen touchscreen: The GM navigation system and the graphics for it are designed with a touchscreen in mind — when entering in a destination, there is a recreation of a keyboard that allows you to punch in your letters and numbers. But, you can’t do that in the Regal. So, Option 1: Use the clickable iDrive knob that falls more readily at hand. You can click the individual letter icons, but going through them takes FOREVER because you’re scanning one letter at a time across a keyboard icon. Audi and BMW both display the alphabet around a circle, which makes it quicker to program and easier to decipher. Or, Option 2: Use the dash knob: This allows you to either rotate through the keyboard or move around it up, down and laterally using the multi-directional pad. Better than option 1, but the knob’s placement is less convenient. Or, Option 3: Forget the knobs altogether and use the voice controls. This works, though it takes a very long time (the playback prompts don’t help) and for some reason, when I tried to use them, it didn’t ask me for an address number. Instead, I only had the option of going to some indiscriminate point on Flamingo Road. Compared to our Acura TSX Wagon or departed Cadillac CTS, the Regal’s electronics interface seems like someone just didn’t try. When a brand is trying to convince people it deserves to be considered amongst luxury brands, it’s details like these that make a car stand above. The Genesis and Equus seem like (and are) luxury cars because Hyundai went all in. I enjoy the mix of economics and psychology, which is why I am a faithful reader of the Freakanomics blog. Their recent podcast on “pain” started off with a good human-factors-related tale of the problematic design of a subway alarm system. I have included a link below to the podcast, but the quick overview is that there is an ear piercing alarm that is triggered by using the “emergency” exit, which is invariably used every day by someone wanting to get out faster than turnstiles permit. The person breaking the rules has to hear the alarm for the shortest period of time and face no repercussions. The law abiding citizens waiting in line to exit get to listen to the alarm the longest. I held off for a while writing this post because I wanted to make sure I could include media Dr. John Senders included in his talk. I think you’ll agree it was worth the wait! At the 2010 APA convention, John W. Senders, Ph.D. presented “One Thing at a Time: From Eye Fixations (1951), to Sampling (1954), to Information Theory (1955), to Workload (1959), to Queuing Theory (1964), to Attentional Demand (1966), Followed by a Lapse of 40 Years.” Video of the talk will eventually be posted on the Division 21 website. Dr. Senders mentioned an eye tracking experiment from the 1950s, before any “eye trackers” existed. The method was to film the eyes of pilots as they scanned each instrument in a cockpit according to instruction. The position of the pilots eyes were coded in the close-up video. For example, a pilot might be told to “look at the altimeter,” and then the exact position of the pilot’s eyes was coded as “looking at altimeter.” Then, when the pilots were using their instruments naturally, a video of this use could be coded by eye position to know exactly when and where they were looking at any moment. In another ingenious methodological development, Senders created a vision sampling device. The video below illustrates how it worked – a mechanical visor rose and fell in front of the driver’s eyes. Dr. Senders came up with this idea of sampling while driving through a heavy rainstorm at different speeds, while the speed of the windshield wipers stayed the same. The visor in the video does the same — the rate of viewing can be controlled and the attentional demands of the driving task measured. For more information, see the CogWorks website. I’ve already covered these techniques in my classes as they are great demonstrations of creativity in research methods. If one has a well defined purpose and goal, a tool can often be created from surprising materials. 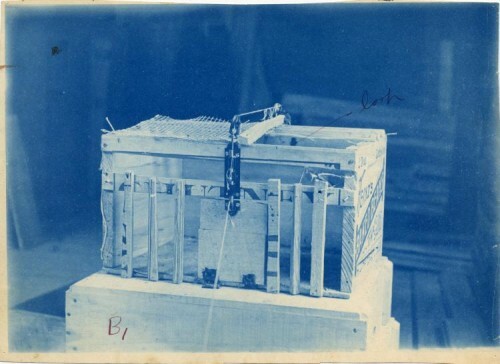 Another example I often cite is the actual picture of Thorndike’s puzzle box — a splintered and rickety contraption that bears little resemblance to the finely drawn illustrations in intro psychology textbooks.